Situated at the intersection of the main city axis and Yanzhan Road, Aedas-designed LAND Experience Center is an interactive exhibition center with a fully immersive space to showcase developer LAND’s vision for the Xi’an city and its development strategies. It is now open for public visit, and can serve as a sales and marketing centre for the company when needed. 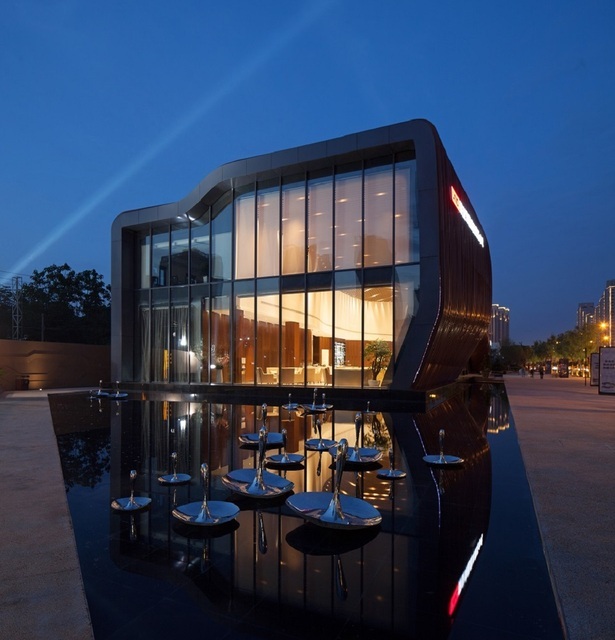 The project, designed by Project Design Director Ping Jiang, consists of an exhibition hall, a multipurpose room, administration offices and a separate display wing. Its sculptural form is derived from the local undulating topography that reflects the duality and dynamics of Xi’an. Orchestrated through a series of events, the center also serves as an interactive hub to showcase the company’s development strategies and visions for the city, while providing sensory experience of the feature programmes. This unique pavilion is also designed for adaptive reuse. Built on a specially engineered steel raft foundation, it is a portable apparatus and will be relocated to an adjacent park later. In the future, the center will be transformed into a museum of contemporary art. Small and intimate in scale, yet ambitious in its urban gesture, LAND Experience Center creates a new cityscape that adapts to both the varied demand of the programme and complexity of the city.